- in almost any combination. Trikes too! Carry all frame styles without modification - No frame adapters needed. 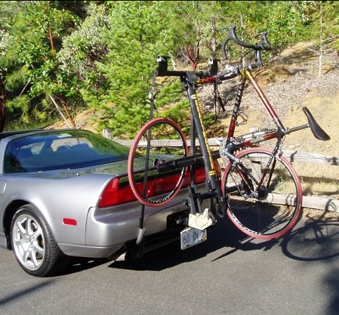 Carry long bikes or trikes with NO vehicle side overhang - Only on a Draftmaster. Easy access to your trunk or hatch - No need to unload to get at your stuff. Bikes ride "in the draft" - Gets bikes off the roof for better gas mileage. Access to any bike at any time - No need to unload other bikes to get at your bike. Bikes secured at points designed for contact - Why risk damage to your frame or paint job? Simple, easy-loading operation - No awkward clamps or anti-sway gizmos needed. Simple assembly - Modular components simply slide together. Draftmaster can be easily disassembled and stored when not in use. Rock-solid receiver connection - Anti-wobble design bolts snugly into your car's receiver. Quality products backed by a two year warranty.